HERE’S A GUEST POST FROM THE “GRASS-FED GIRL” REVIEWING MY DVD, THE DIET FOR HUMAN BEINGS AND ANSWERING 5 COMMON QUESTIONS ABOUT THE DIET FOR HUMAN BEINGS! THANKS, CAITLIN www.grassfedgirl.com. 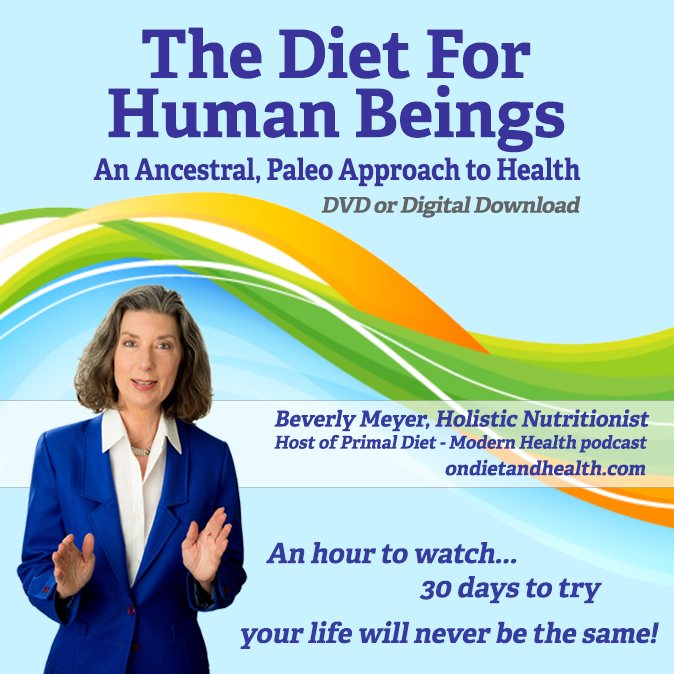 “I recently enjoyed watching “The Diet For Human Beings” DVD about the Paleo Diet by Beverly Meyer, a Holistic Nutritionist and Podcast Host with 25 years in clinical practice. It is professionally filmed, easy to watch and understand, and has well-organized chapters that break the diet down into sections you can review when needed. It’s a great way to share the Diet with friends and family who want to know what you’re eating (and why)! Her video is a perfect gift for anyone on the fence about changing their lifestyle, and answers some basic and vital questions about the Paleo Diet in a very thorough way. Beverly has several shows on her radio playlist on The Diet For Human Beings, as well as many posts on her great blog “On Diet and Health”. She’s also on Facebook at Beverly Meyer On Diet and Health. Here are her ideas on the most commonly asked Paleo questions. If you want to know more, get Beverly’s awesome video. Q: Why should we exclude “healthy whole grains”? A. Every creature, including humans, has the perfect diet it evolved to eat, whether it’s a cricket, a parrot or a wolf. As hunter gathers, we have no instinct to bend over and graze like the animals with special chambers in their stomach who can digest grass and grass seeds. Human stomachs make hydrochloric acid instead, and that’s designed to break down protein, not starch. Grains – rice, corn, wheat – ARE the starchy seeds of grasses and they require a different mix of enzymes than animals, fats and vegetables do. Before the Agricultural Revolution 10,000 years ago, grains were not an important part of the human diet. Human health rapidly declined when we began eating crops and dairy, creating people who were shorter, with weaker bones, more cavities, compromised facial structure, and arthritis. All seeds have elaborate defense mechanisms such as lectins and phytates to keep from being digested so they can germinate into plants. These indigestible seed coatings are toxic to humans and are best suited for animals who have eaten them for millions of years and adapted to their toxins. Wheat, rye, barley, kamut, and oats (which are contaminated during processing) contain gluten. High yield grains have been created through hybridization. This process creates wheat with higher gluten content than ancient grains. These new hybrids are now even more indigestible, creating higher occurrence of allergies and autoimmunity as seen in so many children and adults currently. Q: Don’t fat and cholesterol cause heart disease? A: The natural human diet was mostly wild animal proteins, fats and plant matter for millions of years. Meats became unhealthy when fed corn and soy rather than their natural diets of grass (for cows) or bugs (for chicken). 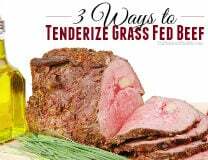 When animals are fed grains, their ratio of healthy omega-3 fats becomes out of balance with omega-6, creating fattier, more inflammatory meat. Humans make cholesterol in the liver to make vital hormones like progesterone and testosterone, and perform many other restorative tasks. The famous 1976 Nurse’s Health Study followed 130,000 nurses for 20 years, and concluded there is no relationship between cholesterol and heart disease. Most people see a rapid drop of triglycerides (a cardiac risk marker) into the healthy range of 50-70 after going on the Diet for Human Beings (Paleo) for several weeks. Hydrogenated oils are made in factories with high heat and chemicals, creating inflammatory omega 6 fats. These oils are new foods that were introduced in the early 1900′s. Saturated fats like butter, ghee, rendered pastured lard, beef tallow, and coconut oil/ milk are more stable sources of healthy fat. 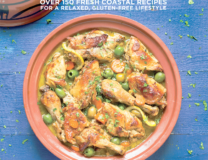 Olive oil and macadamia oils can be useful in small amounts (at low or no heat). Q: Why can’t I eat dairy on Paleo? A: Hunter gathers did not eat dairy until animals were domesticated about 10,000 years ago. Many people have allergic reactions to dairy which can be hard to notice as they are chronic reactions, not acute. Beverly recommends eliminating dairy for at least 30 to 90 days, followed by a dairy reintroduction challenge. Pasteurized milk products are a highly allergenic “food” as the milk is actually oxidized (becomes rancid) during high heat processing. Many people have a better response to raw milk but an elimination diet is the first step in figuring out if dairy is right for you. Q: Aren’t beans full of healthy protein and fiber? A: Traditional cultures knew that beans and seeds require soaking and sprouting to be digestible but that is ignored in our fast paced modern day society. Lectins in grains and beans can bind to the wall of the intestine and block important minerals like magnesium and calcium, setting the stage for brittle bones and many other chronic diseases. Other seed toxins damage the gut wall, exacerbating many health problems. Removing irritating foods will allow an inflamed gut to heal. Fiber from grains can add to a leaky gut exacerbating digestive distress and autoimmune conditions. Depression and anxiety can also result from eating a diet high in beans and grains which inflames the gut lining and causes feel-good neurotransmitter production to be inhibited. Most of our immune system is housed in our small intestine so if you get sick a lot you may want to try The Diet for Human Beings to see if you feel better. We do not need fiber from grains to have a healthy colon except a small amount from veggies and perhaps a little low glycemic fruit. Q: Don’t I need to eat complex carbs every 3 hours to keep my blood sugar stable? A: Natural sugar such as fruit was a seasonal food that was unreliable so we could not have survived on carbohydrates alone. The average person can make all the carbohydrate they need in their own liver. Irregular blood sugar makes us have a crash at 3 pm and 3 am. Our bodies turn excess sugars from grains, sweets, alcohol and juice into fat to store it for later use. We don’t need grains or carbs to survive. Eskimos live without carbs and grains. Insulin is a master hormone that helps control all the other hormones, and it carries important nutrients into the cells. If we eat excess glucose and starch, the body is forced to put that excess glucose into the liver, organs and cells, and we accumulate liver and belly fat. Excess insulin from frequent high carb meals blocks the cells from burning fat, which makes you hungry every few hours. Invest in a dedicated 3-4 weeks start for the Diet for Human Beings (Paleo Diet) to reboot our systems, get over our sugar and grain addiction, and become the fat burners we evolved to be. Get the DVD here. What else you can learn in the video? 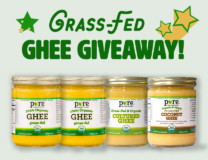 Pure Indian Foods Grass Fed Ghee Giveaway!